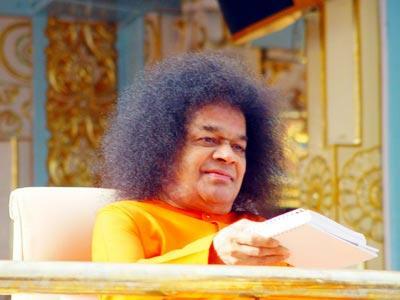 Bhagavan Sri Sathya Sai Baba gave a 70 min personal interview to all the 28 members of SDSC on the last day of their trip to Parthi on August 7, 2004 in the afternoon. Svaami reviewed the architectural, structural, mechanical and electrical plans meticulously and advised us to be frugal in financial matters. Svaami also looked over the Bhoomi Pooja photographs that the group presented. Bhagavan spoke with all the individuals in the group enquiring their names and professions, answered and advised several on their personal questions. Svaami materialized and gave to few members a gold chain with a locket, three rings and a small statue of Goddess Annapurna. Svaami made all happy to their hearts' content. He gave padanamaskar to some and vibhooti packets to all. All left Prasanthi Nilayam in bliss. Svaami asked the group to convey his love and blessing to all in NJ. Earlier in the morning, Svaami was presented with a gift from all members of SDSC. It was a Swarovski crystal heart with red center, given as representation of our Hridaya Pushpa. Svaami took this into His hand looked at it and said "Chaala Bagundi" (looks very nice). At that time, He gave an appointment by saying "All of you come here by 3 o'clock". Sure enough, He started from Poorna Chandra at 2.50 and by that time we were all in His Room by 3PM. That was the first time Svaami came for Darshan in the afternoon before 3.15 in the previous 10 days that the group was there. He showed to all of us that the Lord keeps His promise and is punctual. There is a lesson in that for all of us to learn. While at Prasanthi, the group had the opportunity to serve as volunteers at the Chaitanya Jyothi museum, in the Western Canteen and participated financially towards rehabilitation of 22 huts that were destroyed that week in a nearby village.